If there is a disaster, is Wetaskiwin ready? A crane in Calgary’s downtown is unstable. The bridge over the Elbow River by the Stampede grounds is structurally unsound. Water fills a construction pit in the blossoming East Village – a hole where a building was supposed to emerge. 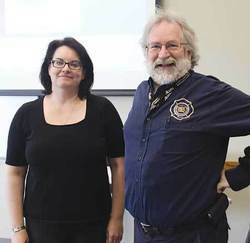 Hope we won’t need it, but if the Wetaskiwin region experiences an emergency or disaster, a great deal of work has gone into ensuring the community is prepared. Part of this on-going planning process was the presentation of two courses to agencies and community volunteers who assist with providing support in the event of an emergency. On June 19th, 2013, Mr. Tom Cox, Emergency Management Training Officer, Government of Alberta provided an overview of the process of evacuating and meeting the needs of people in the case of a disaster or emergency. He also provided practical tips on what to do and what not to do. Mr. Cox stressed the importance of planning and especially the process of managing volunteers to accommodate a wide variety of needs of the victims of the disaster. (1) Registration and Inquiry- If residents are evacuated from their homes (or off the highway in the event of a snowstorm) to a Reception Centre, we need trained people to assist in registering them and providing information to family that may be trying to find if they are safe. Klassen describes four interdependent components of emergency management.